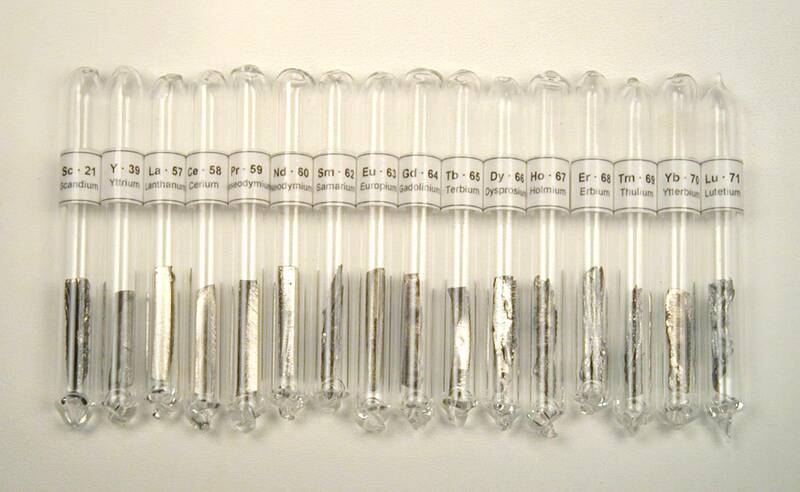 Here is a complete display of Rare-Earth metal element samples preserved in vacuum-sealed glass ampoules. In this set are 16 unique, fascinating and exotic metals which are rarely or never encountered in everyday life. Until very recently these metals were not available to the general public, except at exorbitant prices for small quantities. Recent improvements in metal separation techniques and wider distribution allow these rare elements to be offered at this price. Each metal sample is permanently vacuum-sealed in a clear glass ampoule. This sealing method is necessary to preserve the metals and allow them to stay shiny for years. 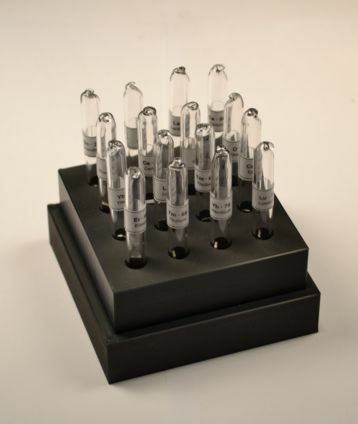 The set is provided with a very attractive black plastic base with a matching clear acrylic cover. Makes a unique gift for anyone interested in chemistry or science! The metal pieces will be pre-cut rectangular strips cut from cast metal. All will be clean pieces with shiny exposed metal with no oxide or other corrosion. The europium will not necessarily be shiny but it will show exposed bare metal (It is naturally steel-gray in color). 2. All samples will be one single piece per element, no powder or small pieces. 3. All samples will be permanently vacuum-sealed in glass ampoules. 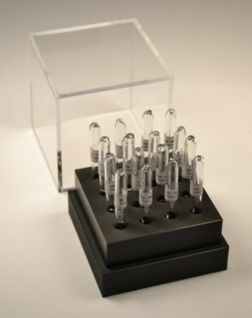 The ampoules are about 1/4 inch diameter (7mm), 2 1/2 inches long (64mm). A printed label will be attached to each ampoule clearly identifying the metal, its element symbol and the atomic number of the element. 4. A writeup of descriptions of the properties of each metal. 5. 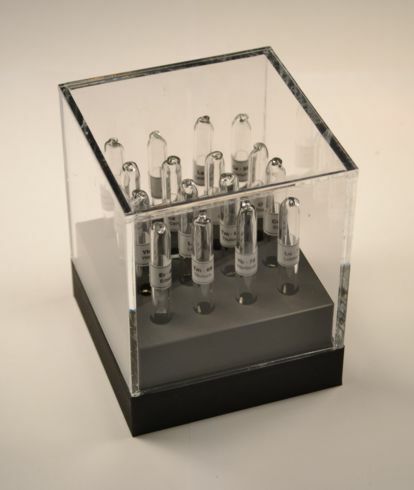 A base made of solid, durable black plastic with holes to store the ampoules for display or easy removal. 6. A clear acrylic cover that fits over the base. To view a long-term experiment conducted to determine the effects of exposure to air for these metals, click here: Rare-Earth Metal Exposure Experiment. 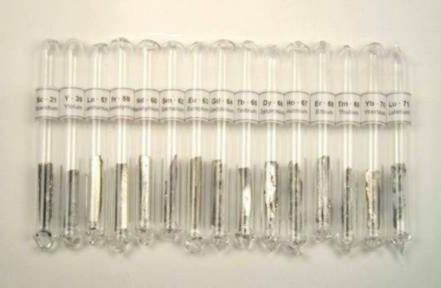 This experiment clearly shows why some of these metals need to be preserved in glass ampoules in order to keep their shine and to keep the metals from corroding. Set Made in USA. Typical leadtime for shipment is 2 weeks.